Exhibition poses several dangers for fragile artifacts, and textile items are among the most vulnerable. Light deteriorates textile fibers over time. Exhibit cases and custom-built mounts must be constructed from preservation-appropriate materials, otherwise the risk of acid migration is high. While many museum textile collections show evidence of damage by both light and pollutants, examples from two county historical museums in North Carolina are particularly instructive. 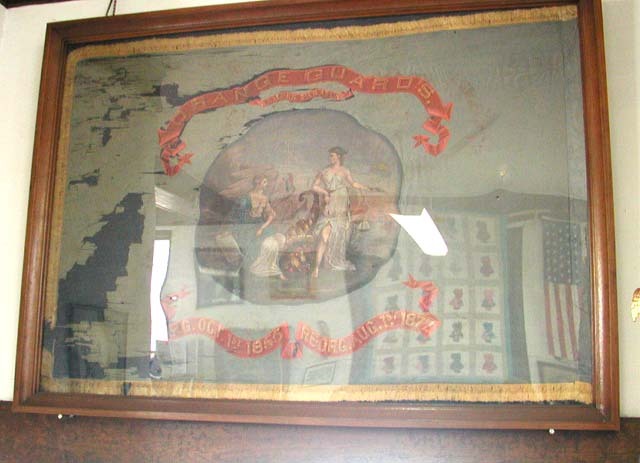 Years ago “Museum A” framed a 130+ year-old silk flag and hung it for display. Lovely, damaging, natural light flooded the galleries, and the flag’s silk ground gradually disintegrated. (Notice the dark loss areas on the piece’s proper left.) Sadly, this flag should be retired from exhibition and Museum A should take measures to control light in its galleries in order to protect other textile pieces (shown in the frame’s reflection). There is still hope, however, for Museum A’s exhibition goals. Digital technology now generates high quality reproductions. This museum should reproduce its piece to maintain its current exhibition and perhaps distribute the facsimilies more broadly. In addition, the museum has recently instituted an “Adopt An Artifact” program and the flag is up for adoption. If conservation funds materialize, the original artifact can be stabilized and stored safely. “Musuem B’s” textile tale also contains elements of degradation and hope. 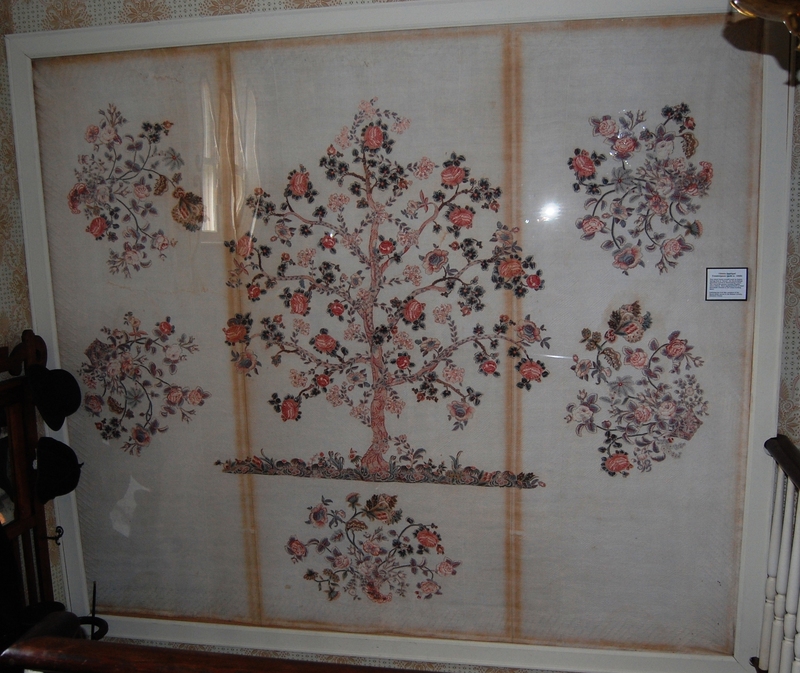 During the 1990s Museum staff retrieved a beautiful appliquéd quilt from storage, dating circa 1825, with a strong local provenance. In order to prepare the piece for exhibition, Museum B spent more than a thousand dollars to send the piece to a New York conservator for stain removal. At the same time, Museum B found a place inside its historic house to display the quilt permanently and had a case custom fabricated for that purpose. Unfortunately, staff or contractors placed inadequate barrier layers between the case’s wooden frame and the quilt. After more than a decade, acid migration stains from the wood’s off-gassing mar the piece. Current staff members at Museum B are aware of the problem, are seeking funds to send the piece out for further conservation, and are planning to design (with a conservator’s help) “permanent” housing for the quilt, using carefully selected materials. These local stories highlight the need for continuing accessible training in collections care across our state. From Currituck to Cherokee (C2C), our team is traveling around regularly to teach preventative conservation methods in order to avoid this kind of damage to our state’s artifactual treasures. Our mission to reach out across the state to nearly 1,000 cultural heritage institutions has compelled me to drag myself into the 21st century (only a little over a decade late). Other statewide field service professionals have convinced me that social media is an effective way to build communities. So, I’m learning about Facebook, and we’ve started this blog to try and distribute helpful information and generate discussion amongst our C2C constituents as broadly as possible. North Carolina’s Historic Sites often use Facebook as a way to promote their individual locations as well as connect with a dispersed audience. For instance, Reed Gold Mine posts a quote each day about gold on its Facebook Page. Not all institutions need be quite so active, but a good rule of thumb is to keep your audience engaged by posting 2-3 times each week. Here are some tips I’ve learned from a workshop I attended by NC Historic Sites social media experts, especially Andrew Duppstadt and Marion Inabinett, backed up by some suggestions from a recent National Trust for Historic Preservation blog posting (http://historicsites.wordpress.com/2011/06/09/social-media-training-for-historic-sites/). Your site is participating in social media, whether you want to participate or not, so you might as well manage it to your advantage. For example, Filoli (a National Trust for Historic Preservation Site) hasn’t created a Facebook Page but four other people have. That means other people are now controlling the site’s image, message, and brand in a place with 500 million active users. Do an internet search for your site and try to “claim” any extant webpages for your site as an administrator. Consider setting up a Facebook Page if your site does not have its own website. You can add, change, and update as necessary. It’s a nimble promotional tool. Once your Page has 25 Followers, you can claim a Username, which then allows you to have a Facebook URL (website address) and makes it easy for non-Facebook users to find your site. Sites and organizations need to have Pages not Profiles in Facebook. Facebook can terminate your account without notice if they catch you, and you’ll lose all of your content and connections. How can you tell the difference? Profiles are for people and have Friends. Pages are for organizations and have Likes (formerly Fans). Various social media sites allow you to measure the impact of your work. Many provide analytics, although it may be not easy to determine at first. Click on the “insights” section in Facebook to find page statistics. Try using Klout to score your overall influence. If you already have a profile on Facebook and use it regularly, then setting up a page for your institution will not be difficult. But if, like me, you’ve resisted jumping on board the Facebook bandwagon, then getting used to the system will take some time. Luckily, we won’t have to search too far to find Facebook experts to guide us. Social media tools hold great promise to grow audiences in order to make our cultural heritage organizations ever more relevant to our communities. I hope that everyone is in the midst of preparations for the arrival of Irene. The Governor has just issued a State of Emergency for counties east of I95 and the impact will be felt well inland if the current forecast track holds. The staff of the C2C project hopes that you stay safe this weekend and that your preparations today and tomorrow will ensure that you and your collections survive the storm. If you need assistance after the storm passes and have no idea where to begin, call our offices at 919-807-7289 and leave a message. Project Director LeRae Umfleet will check the phone regularly over the weekend and will be happy to help in any way she can! Volunteers, board members, and frequent visitors to cultural heritage institutions are likely to love old things. Not only do they tend to appreciate your museum or site’s collections, they also often have deep attachments to their own heirlooms. Presentations on artifact preservation have the potential to become community building events at your institution. The Cape Fear Museum in Wilmington has developed several public programs around preservation. These include a series of conservation lectures, workshops, and special tours of the collection. By charging attendance fees, they are able to sustain these activities. Designed to educate potential donors, the programs also invite new audiences to become involved. 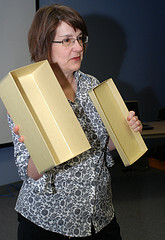 Barbara Rowe, Cape Fear Museum Curator, discusses archival boxes. 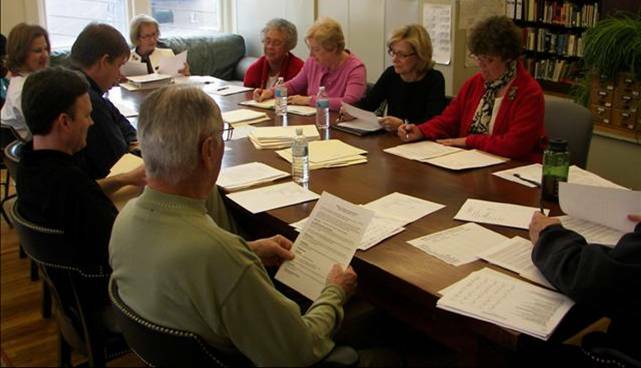 Here are some tips for building a successful public program around preservation topics. Make it fun! A show and tell roundtable will be interesting for participants and you can offer advice on, or lead discussions about, the specific materials the participants bring in. Familiarize them with conservation and how to find a conservator. Concepts like reversibility in treatment are important to cover. Recommendations for trusted local conservators would also be helpful. Suggest a few sources to learn more in-depth information about preservation, but keep your own presentation simple. So much information now exists on the internet that it can be overwhelming for folks who just want to venture into preservation topics. The Gaston County Museum has built a good thorough overview of care recommendations for different materials into their website: http://www.gastoncountymuseum.org/PreserveObjects.asp. This would be a great starting point for participants who request more information. Focus on proper storage—no attics or basements. Explain that high temperature, RH, and light levels accelerate degradation. Discuss the need to provide acid-free containers and padding for heirlooms. These products will buffer RH fluctuations somewhat and serve as barriers to pests. Offer sources to the public for purchasing the products you recommend. The Cape Fear Museum sells individual acid-free boxes and small amounts of acid-free tissue in its gift shop. Ordering from archival suppliers is often beyond the means of most individual members of the public. Buying surpluses of key supplies in order to re-sell small quantities to your constituents, is one good solution. Additionally, you should identify the products they can obtain and convenient sources. Washed, unbleached muslin or cotton knit fabric can substitute for acid-free tissue when packing textiles for storage. Clear polypropylene or polyethylene bins can substitute for archival storage boxes. The plastic does not have the buffering capacity of archival board and does not allow for air flow, but it can still be a reasonably protective material. Teach participants to look for abbreviations for these materials on the underside of bins (PP, PE, HDPE, LDPE). They should avoid plastics labeled polystyrene (PS) or polyvinyl (PV), as these materials will emit pollutants overtime. Preservation programs will not only educate your participants about how to care for their own artifacts, but these presentations will also enhance awareness for the difficulties and costs involved in collections care. Hopefully, participants will leave the program with a deeper appreciation of the value of your institution’s community service and the work you do. Have you tried this type of public program at your institution? If so, what went well and what did not work? 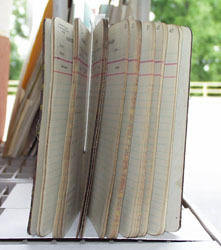 A nice folow up article on the archival thefts at Maryland Historical Society. This article demonstrates both the challenges of keeping our collections safe and the protocols we use to protect them. Does it make you wonder how safe your collection is? Many of our cultural heritage collections exist to preserve the significant past of a region or locality. But the determination of significance is always subjective. Decades ago, curators focused on connoisseurship in selecting artifacts for perpetual care. Aesthetics and the quality of craftsmanship were often the most sought-after attributes in acquisitions. Today, those of us responsible for collections are trained to value the stories that the objects (and their accompanying documentation) can tell. Oftentimes, souvenirs are not the most beautiful or well made artifacts, but many incorporate iconography unique to or important for the regions they represent. Moreover, although souvenirs are often created for a tourist market, their prevalence helps shape place identity for residents as well as visitors. 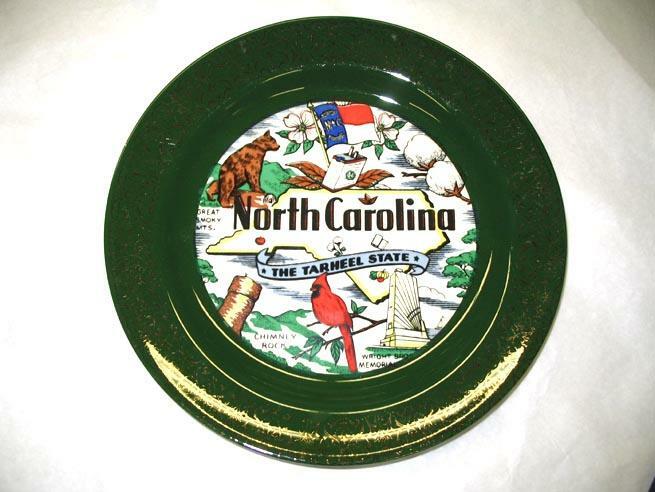 Souvenir objects, like this plate in the NC Museum of History’s collection, alert both residents and tourists to prominent sites to visit, important agricultural products, and symbolic flora and fauna. Overtime, these kinds of objects represent the changing iconography of a place. The dogwood and cardinal, for instance, were adopted as official state symbols in 1941 and 1943, respectively. Similarly, after the anti-smoking campaigns of the late 20th century, a pack of cigarettes (just above the “C” on the plate) would be unlikely to appear as an emblem of North Carolina. Consequently, the imagery not only dates the object, but also offers clues to changing perceptions of what is NC pride-worthy. So, don’t discount every t-shirt and go-cup you come across for your collection. Consider incorporating souvenir collecting into a strategic plan for your collection. You’ll want to be selective and take quality and of course, materials in account. (Avoid things made from rubber, such as some magnets, since they will release harmful pollutants as they degrade.) Most of all, ask questions about how the object is representing your institution’s locality and how it relates to place identity in your area. If the answers are interesting, then the souvenir may be worthy of your institution’s care for perpetuity. Last fall some of our C2C team attended an interesting presentation about an exhibition in Colonial Williamsburg entitled “Conservation: Where Art and Science Meet.” Emily Williams, a conservator at CW, developed the exhibit. Most surprising about her presentation was how popular the topic proved to be; in fact, that show had record-breaking attendance. Colonial Williamsburg's touch panel from the exhibition, "Conservation: Where Art and Science Meet"
One of the more interactive parts of that exhibit was a type of “touch panel,” where visitors could touch an array of materials partially protected by a Plexiglas cover. These included (from left to right) steel, marble, velvet, unfinished wood, brass, leather, painted wood, cotton fabric, granite, and copper. Panel text invited visitors to touch the various materials, and they could see the contrast between the touchable areas and the more pristine sections beneath the Plexiglas. Many were amazed at how quickly certain materials degraded. 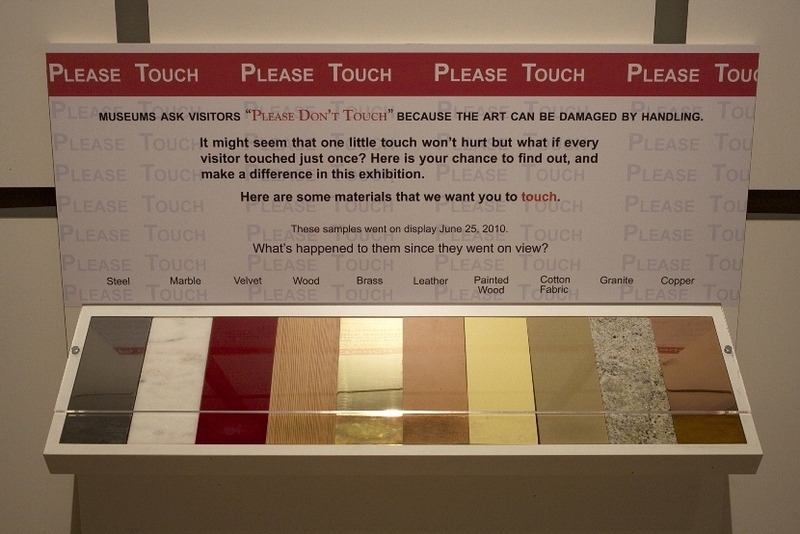 The touch panel would educate visitors about the need to protect artifacts from handling and other damage. A donation box accompanying the touch panel would remind visitors about the costs involved in artifact preservation and the need for those activities to be a perpetual part of the institution’s budget. 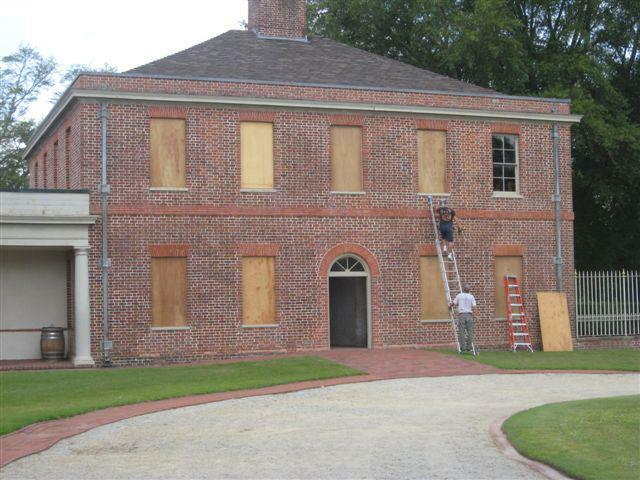 You would not have to include all of the same materials that Colonial Williamsburg showcased. Painted wood, scrap metal sheeting, blotting paper, and velvet are all inexpensive and fairly easy to obtain. Brainstorm additional materials to include that would show wear and tear from handling. If you have a taxidermy collection, for instance, you might want to include feathers. If you give this project a try, we’d love to hear about its success. What other ideas have you tried in order to promote preservation (activities and funding) amongst your institution’s constituents? Terry Collins, a book binder and book repair expert at Salem College and a regular C2C workshop participant, provided the following guidance to another participant. Because many more of you may find his advice useful, we’ll post it here. Dry the book out, as best you can. If the spine is fairly sturdy, you can open it fanlike for drying. Make sure you have a good amount of air circulation—use a fan or take outside for a short period. Once the mold is dry, vacuum with a soft natural bristle brush, brushing from the direction of the spine toward the vacuum nozzle. Keep the nozzle an inch or two away from the book and cover it with gauze or nylon netting to prevent sucking up loose pieces. Vacuum the inner hinge area too, as mold spores like to rest there. (and discard the filter afterwards.) 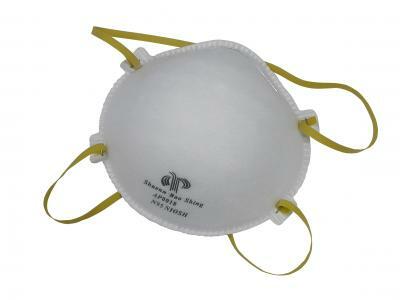 When working with moldy objects, it’s always a good idea to protect yourself with a NIOSH-compliant respirator. Interleaving with blotting paper, every few pages, will help draw the moisture out of the book. Always try vacuuming first before other treatments. Without getting into technical treatments that require a fume hood, collections managers can LIGHTLY moisten a paper towel with 70% isopropyl alcohol (rubbing alcohol) and wipe down areas like the inner hinges, and the head and tail and fore-edge of the text block. If the paper cockles, then the towel is too wet. Test a small area first to see if the alcohol causes the ink to run. Discard the paper towel wipes frequently. Do not try and wipe the “fuzzy lumps” of fungus, it will spread and stain the paper. (I think mycologists call the “fuzzy lumps” mycelia). Drying, alcohol, and freezing treatments all kill active mold, but the spores are just waiting for favorable conditions to return and start up again. So, preventative measures are the key. Remember to try to keep RH below 65%. Archival products like acid-free boxes and silica gel can buffer humidity changes and protect the storage micro-environment from excess moisture. Leather, too, can be wiped with isopropyl alcohol. But one has to be careful. Any added moisture can stain or cause dye transfer. If the leather has rotted to a condition known as “red rot”, then the alcohol will darken the leather and make it brittle. There is chemical treatment for “red rot”. But red rot cannot be turned back into leather. The chemical composition of the leather has changed. Basically, the sulfuric acid used in the tanning process has deteriorated the leather into dust. Thanks to Terry for sharing his knowledge. Since nearly all cultural heritage collections contain at least some books and paper, his tips are really useful. Interesting artifacts often show up in the strangest places and at the oddest times. On July 9, 2011, Dr. Larry Babits, Professor and Chairman of the East Carolina University Maritime History Program, and Scott Douglas, Interpreter at Fort Dobbs State Historic Site, were walking along an approximately 100-year-old drainage ditch at Fort Dobbs when they discovered a rusted piece of metal protruding from a recently eroded spoil pile. Upon closer examination, they realized that this fragment might actually have been associated with the occupation of Fort Dobbs during the French and Indian War. After carefully removing the artifact and recording its location, they made arrangements to have it transported to Raleigh, where, after conferring with Historic Sites Curator Martha Battle Jackson, state archaeologists arranged to have John Clauser conserve the artifact. Expert examiners verified that this artifact is a hand-forged, wrought iron, drawknife or spoke-shave that dates to the 18th or early 19thcentury, possibly of the period of Fort Dobbs’ interpretation. 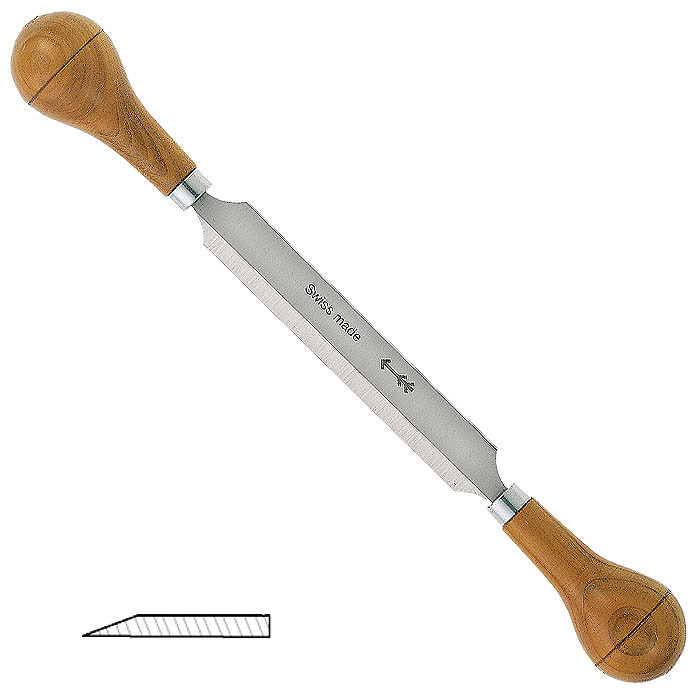 Perhaps the Fort Dobbs drawknife was similar in form to this tool when it was created. Accidentally unearthed treasures, such as this drawknife, are exceptions in current archaeological practice. Field workers and researchers prefer to conduct systematic investigations of underground layers. In fact, state laws prohibit individuals from receiving or exchanging archaeological resources found on state land. Historic Sites managers and the NC Office of State Archaeology must always be involved in artifact recovery. Through careful and diligent site stewardship, artifacts—whether found by design or default—can and do form important parts of collections, site interpretation, and exhibits. 1. They should raise funds to support the organization’s activities—either with personal contributions or through active involvement in fundraising events and other activities. 2. They should represent the core constituencies of the institution, as well as audience groups that the museum is attempting to build. 3. They should have an understanding of the staff’s functions and some members of the board should work with staff on key aspects of operations including (but not limited to) creating policies, approving accessions to the collection, and special events. Responsibilities for these activities should be clear to new board members and reviewed regularly by more experienced members. When commitments to these elements cannot be met or maintained, there should be a procedure in place to replace that member. In my own experience, there is often discordance between board members’ notions of their purpose and staff members’ notions of the board’s purpose and vice versa. Systems of shared communication and joint training opportunities can foster cooperation. Would you find this helpful for your organization? Do you have any suggestions for board training content?